For LightSPEED 3G Headsets. Inch thick Confor-Foam soft seals with leather covering. Pros: Fit on like new. Perfect replacements for LightSpeed 3G!! Review: Had been living with deteriorating ear seals for a year or so, finally looked em up, perfect fit, they just pop right off, pull on the little tab inside the ear seal. Feel like brand new, nice seal and all. Review: They installed easily and were cheaper than ones I saw for sale on ebay. Now, if Lightspeed would get their act together and make ear and head cushions that don't start peeling a few months after they are put in service. The headset are great, but the cushion parts need improving badly. Review: I needed new Ear Seals for my Lightspeed headset. This replacement set fit the bill perfectly. Cons: A little tricky to install, but work like new. Q: Will the 3G replacement ear seals fit a 20K Lightspeed head set? A: For the Lightspeed 20K headset, you would want to get the Lightspeed XLc Soft Ear Seals instead. A: You will want to use the LightSPEED XLc Soft Ear Seals for your headset. They are 1 1/2 inches thick Confor-Foam soft ear seals for the LightSPEED XL, XLc and the K series headsets. Q: What ear seals fit the lightspeed 23G headset. A: Yes, these will fit the Lightspeed Twenty 3G headsets. Q: will the 30 3g ear seals fit the 20 3g headsets? A: Yes, these will fit both the Twenty 3G (20-3G) and the Thirty 3G (30-3G) headsets. Q: Are the lightspeed 3G seals for the lightspeed thirty3G? do I get a pair? Need mic covers also. A: Yes, these will fit the Lightspeed Thirty 3G headset. Yes, when you order this item you will get a pair of ear seals (one for each ear). We also offer the Lightspeed Mic Muff that will fit on the Thirty 3G headset. 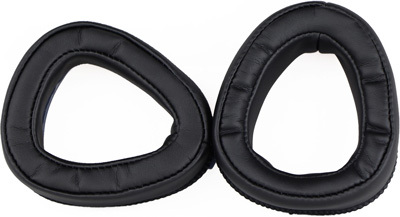 Q: do the lightspeed 3g ear seals fit david clark headsets? A: No they would not. You would want to order replacement David Clark Ear Seals. Q: Will these also fit the XL headset series? I find the original 1.5 inch ear seals a bit thick. A: These will not fit on the LightSPEED XL series headsets. The only ear seals that we have for the XL(c) series are the 1.5" variety.